Have you ever wondered what it would be like to run through two states not to mention, our two favorite states? Well, heres your chance to find out! 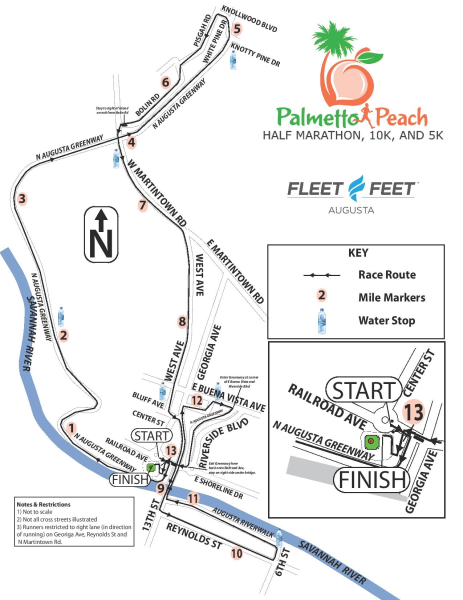 Cross the start line in South Carolina (The Palmetto State) at the state-of-the-art SRP Park, in North Augusta. Listen to the spectators cheering fade into chirping birds and rustling leaves as you find your stride on the peaceful and picturesque North Augusta Greeneway. Skip through the Mayberry-esque downtown North Augusta before crossing the Savannah River, into Georgia (The Peach State) . Youll be feeling really good as you pace through Augusta, the hometown of the Godfather of Soul. Scamper back into South Carolina to experience some southern charm and Charleston-inspired architecture. Slide into home base at SRP Park before snagging your medal! Dont forget to celebrate your home run finish with our lineup of post-race activities! Finisher Medals for all distances! Great course, well managed & very cool finish. Well organized and the course was super easy to follow. No confusion! !